An eggless french toast recipe with vegan coconut milk batter. Soft and pillowy insides with a crunchy sweet outside, all topped with maple syrup and fresh berries. French toast is my go-to guilty pleasure breakfast. I mean what’s not to love? It’s light and fluffy on the inside, crunchy on the outside, and oh so sweet. Plus you can top it with just about anything and I mean anything. No seriously, if you haven’t tried a dessert French toast with ice cream and chocolate then you’re missing out. It’s almost as good as these vegan date caramel slices. But what about us vegans, do we have to forego this glorious breakfast food just because it uses eggs and milk? 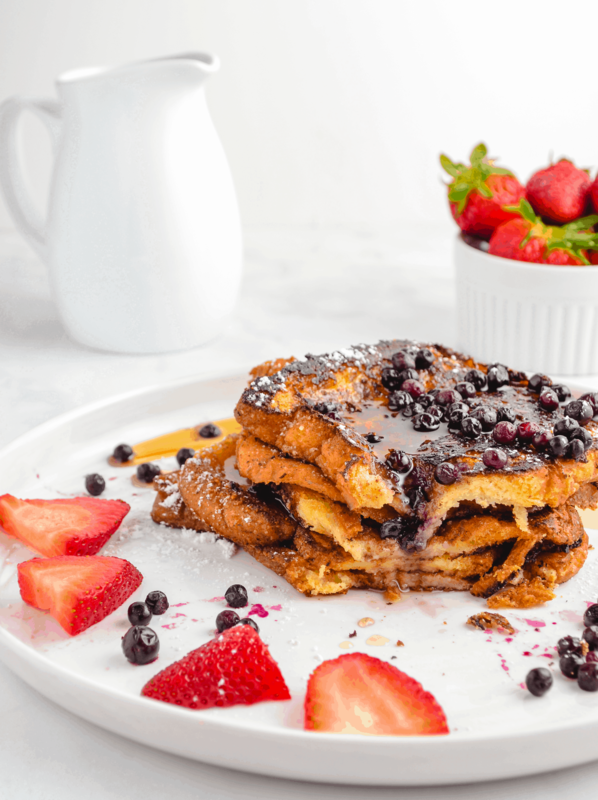 This recipe will show you how to make an egg-free, dairy-free, 100% vegan french toast that’s even better than the original! What can you substitute for milk in French toast? Any plant-based milk works great as a substitute for dairy milk in French toast. You could technically even use water because you really just need a liquid ingredient for the right consistency. The eggs on the other hand are a bit harder to substitute for. Eggs are what give your typical french toast batter a thicker consistency and they also help hold everything together. To substitute for the eggs in this recipe, I used coconut milk (the full fat kind) and almond flour. This kind of coconut milk typically comes in a can and when you open it there will be a layer of solid coconut fat and then the water/milk underneath. When whisked together, these two layers create a thick and creamy consistency that’s perfect for French toast batter. The almond flour is there to help bind things together and thicken the batter even more. Add the coconut milk (both the solid and liquid layers), almond flour, vanilla, and cinnamon to a large bowl. Whisk together until you have a smooth and thick batter consistency. Dip the bread slices in the batter to coat each side, making sure the batter has a chance to soak in. Let any excess batter drip off, then add to a hot non-stick pan. Heat a non-stick pan over medium high heat. Add vegan butter or a cooking spray to coat the pan. Working in batches, grill the french toast until golden brown, about 4-5 minutes per side. Add more vegan butter or cooking spray in between batches as needed. Fresh Tip: Keeping the pan coated in butter or a cooking spray is important so that the batter doesn’t stick to the pan. This happens easier than with a non-vegan French toast because there are no eggs in the batter to hold it to the bread. The batter is only part of the French toast equation, the bread that you use is equally as important. If the bread is too thin or soft (like typical white bread loafs), it will fall apart when you soak it in the batter. If the bread’s crust is too hard, then it will come out chewy. Brioche bread is perfect for French toast and it’s what is traditionally used, but brioche usually contains eggs and milk. Looking for a healthier vegan breakfast that’s just as delicious? Try out these creamy matcha overnight oats or this coconut mango chia pudding! If you want to save money on the organic ingredients like coconut milk and almond flour used in this recipe, then check out Thrive Market! Thrive Market is an online health foods grocer that offers huge discounts and free shipping on all your favorite brands. I regularly save 30% off my grocery bill by shopping at Thrive Market, and it’s delivered to my door step! If you’re tired of overpaying for the healthier organic brands that you know your body is thanking you for, then give Thrive Market a try and save an extra 25% off your first order! An eggless french toast recipe with vegan coconut milk batter. Soft and fluffy insides with a crispy sweet outside, all topped with maple syrup and fresh berries. Add coconut milk, almond flour, vanilla, and cinnamon to a large bowl and whisk into a smooth batter. Dip bread slices in the batter to coat each side. Let excess batter drip off, then place in pan. Top with fresh berries or banana, drizzle with syrup, and enjoy! Save 25-50% on your favorite healthy organic brands and have them shipped free to your door with Thrive Market. Click here for an extra 25% off your first order! Be sure to coat the pan with vegan butter or a cooking spray so that your batter will stick to the toast and not the pan!